Harry Burrows is one of the men on the Bottesford ‘church list’ of WW1 servicemen. His son, Bill Burrows is thanked and acknowledged for the information he provided about his father. Harry Edgar Burrows was born in October 1884 at Pointon, Lincolnshire. He was the younger of two sons of William Burrows, who was born in 1841 at Burton Coggles. His mother was called Elizabeth in the 1891 and 1911 censuses, but Catherine in the 1901 census (the reason for this inconsistency has not been determined, but it may well be that she was called Elizabeth Catherine). She was born in 1846 at Swinstead, Lincolnshire. William Burrows was a farmer. In 1891, when they farmed at Mount Pleasant, Pointon, there were five children: Mary (aged 22), Ada (19), Ernest (12), Edna (10) and Harry (6). A story was recalled, in his Obituary (1946), that he had cheated death when he was a boy. Aged nine, he fell into a reservoir at Aunby, near Stamford, and was saved by his brother-in-law who had to give him artificial respiration for 20 minutes before he regained consciousness. The Burrows moved to Bottesford in 1896, when Harry was twelve years old, and farmed at Lodge Farm on Nottingham Road, before moving to The Debdales, an isolated farmhouse in the fields south of Nottingham Road. But the land there was considered not of good quality, and by 1901 the family had moved on, keeping just one field at Debdale. They moved to Rectory Farm, at the end of Nook Lane (now called Pinfold Lane), where there were four children at home: sons Earnest and Harry, and daughters Charlotte (30, born 1871) and Edna. By the time of the 1911 census, William had died and Elizabeth was head of the family. She kept Rectory Farm, which was worked by Earnest and Harry, supported by their sister Edna. Harry Edgar Burrows enlisted on the 7th December, 1915, as 34390 Private in the Duke of Wellington’s (West Riding) Regiment where he was classed as a gunner with the 1/4th Battalion and then the 5th Battalion. 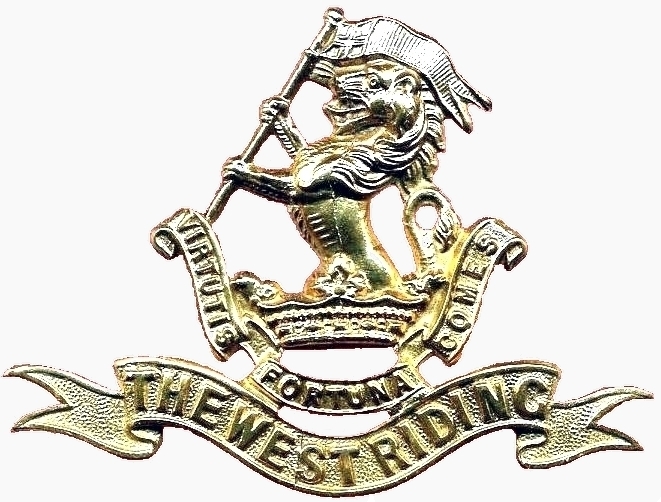 The records also indicate that he became 33056 Pte Yorkshire Regiment, but this must have been very late, as the newspaper report issued after he had been severely injured in September 1918 put him in the West Riding Regiment at that time. Harry Burrows had a very hard time during the fighting. His son William (Bill) has recounted a family story that his father said that, during the Great War, he never met anyone from Bottesford, only the horse that had been requisitioned from the farm. He was injured in 1916 and invalided out of the fighting, but he was able to return in 1917. He was injured in his right eye in the spring of 1918, probably during the German Spring advance, then again, losing his left eye completely, in September, 1918, during the advance on Cambrai. The Grantham Journal, in May 1917, reported only that he “had been slightly wounded in his left cheek”, though it is likely that his injuries at this time were more severe. Bill Burrows recalls that a bomb had exploded and his father was injured, not by bomb splinters, but by the dust from the explosion. He was blinded while taking part in the final advance of the British Forces leading to the capture of Cambrai. 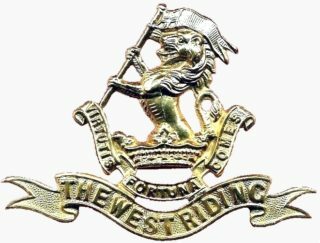 On the 28th September, 1918, the Grantham Journal carried the following account: Wounded – Pte Harry Burrows, of the West Riding Regiment, has been seriously wounded, on the Western Front, and is now in hospital in London. He has lost his left eye, and has sustained injuries to his head, but is making good progress, and his condition is very hopeful. He first went to France in 1916, and after a time was invalided home. He went to France last year, and this spring sustained an injury to his right eye. After he died in 1946, the obituary in the Grantham Journal repeated that he had lost his sight in the advance on Cambrai, 1918. He was awarded the Silver Badge, which was presented to service personnel honourably discharged due to wounds or sickness during World War 1. It was first issued in September 1916, accompanied by an official certificate of entitlement. Made of sterling silver, it was intended to be worn when the owner was in civilian clothes. At this time, white feathers were often unjustly presented to apparently able-bodied men who were not in uniform, without regard to their injuries or sickness. The badge was intended to prevent this shaming. It had the royal cipher, GRI, and around the rim “For King and Empire; Service Rendered”. Each badge was uniquely numbered, B161064 in Harry Burrows’ case. Harry Burrows was discharged on the 26th February, 1919, and was awarded the British War Medal and Victory Medal. 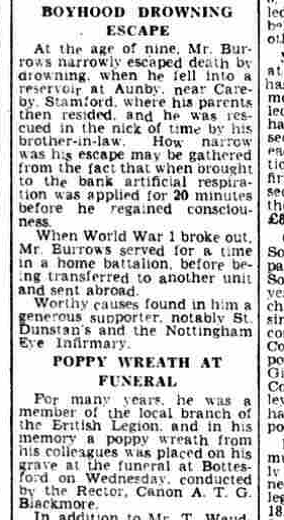 Harry Burrows supported St Dunstans and the Nottingham Eye Hospital throughout his life and was a member of the local branch of the British Legion. He always wore a patch on one eye, and had strategies for coping with his disability while working on the farm. When water was pumped from the well into the trough, there was a large stone on the top of the trough. The flat stone had a hole in it, so that he was able to put his finger in to test the water level before it over flowed. This stone is now being made into a memorial for Harry Edgar and his wife Phillipa Burrows. In the twenties, everyone who worked on the farm had instructions that the farm equipment and such ordinary items as forks and buckets had to be replaced in exactly the same position, in case of a trip or fall. Harry used a stick to find his way across the field and over a bridge to feed the poultry. He was able to milk the cows because that was something he could do by touch. Tom Waudby was the farm foreman, and a man named Hallam (perhaps ex-serviceman Harold Hallam of Orston Lane cottages) also worked on the farm. Electoral records show that in 1923, Harry, Ernest and Edna Burrows were at Rectory Farm, and that by 1926 Phillipa Burrows, Harry’s wife, was also living at Rectory Farm. Philippa Hannah was the daughter of Edward James, and was born in March, 1890. She had lived at Nook Farm, Pinfold Lane, close to Rectory Farm. She and Edgar Harry were married in 1925, and they had 2 children, Elizabeth and William James. Philippa Burrows died in March 1974, aged 84. Earnest, Harry’s brother, did the paper work for the farm, but after he died in 1944 Harry Burrows continued to work the farm. He was milking the cows when he had a seizure and died on the 19th January, 1946. His obituary, in the Grantham Journal of the 25 January, 1946, repeated that Harry had lost his sight in advance on Cambrai 1918. He was aged 61 when he died. Lost his sight from injuries sustained during 1918. At some point he transferred to the Yorkshire Regiment.